In this blog post I detailed how easy it was to create subsites in Drupal. Subsites have the benefit of sharing the same codebase so the filesize and memory footprint on the server is much lower. But what happens when, for whatever reason, you want to move that site away and stop it from being a subsite. 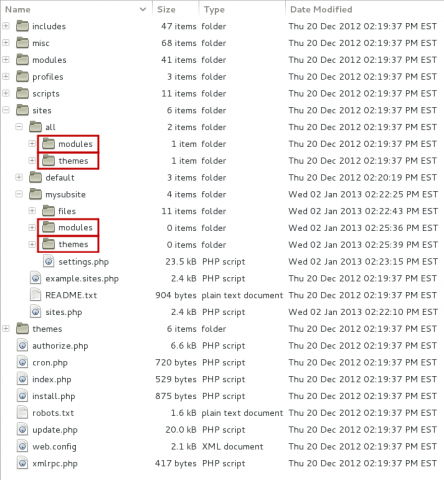 Subsites can use modules and themes from a number of directories. In the same way that a standard Drupal install may use modules and themes from the module and theme directories under sites/all and sites/default/. So too, the subsite may use modules and themes from both the all folder as well as its own subsite folder as detailed in the image. We must therefore ensure that both shared resources (such as those taken from sites/all) and subsite only resources (sites/mysubsite in the image) are copied to the new single site. Before doing any file or database altering it is strongly advised to backup your filesystem and database! Ensure modules and themes from both sites/all and sites/subsite folder are moved into the sites/all directory within the new single site directory. Take the sites/subsite/files directory and move it to sites/adammalone/files in the new directory. If you have modules using libraries stored in sites/all/libraries, be sure to copy the libraries to the new single site directory. This handles all changes and movements in the filesystem. Since Drupal utilises a database to store the majority of its settings we must make a couple of amendments there too. We must ensure that the new site has the filename field altered to the new filename location for all three of the system, registry and registry_file tables. The difference in the database can be seen here. Since going through things manually is dog work we can use a couple of SQL queries to alter everything for us. Connect to the database by typing mysql -uUSERNAME -pPASSWORD -DDATABASENAME or navigate to the new site directory and type drush sqlc. Finally change your filesystem path(s) from sites/mysubsite/files to sites/adammalone/files. You may need to alter some DNS or apache settings to reflect the changes but after following the above instructions there is nothing more in Drupal to be done! I have been struggling for a long time to move complex multisites to single site installs. This tutorial really helped me, together with the necessary database queries from another tutorial (in reverse order of course): https://www.youtube.com/watch?v=48ZRWqQn-GE. I've been thinking about writing a similar instructional for people wishing to move from singlesite->multisite too as it's something I see fairly often. Glad this could help you! I guess also the paths for embedded images inside nodes' body fields need also to be renamed using SQL to reflect the changes in the location of the "files" directory. Is that right? Thanks. This depends on how the files are inserted into the node bodies. A module like media will not require this although hard coded image URLs will need an alteration against the field_data_body table.